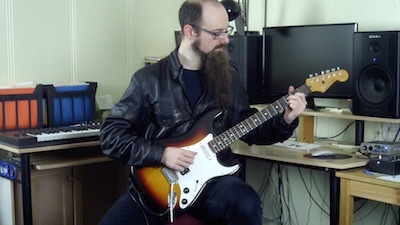 Aren't you tired of the "usual" guitar licks and chord progressions that everybody uses all the time? Your favorite musicians seem to find endless ways to sound fresh every time they play... and you always sound the same. Wouldn't you like a new idea to play with? Something that sound good, but different than what you are doing? Sometimes to find something new you have to rediscover something old. Today we are going to see the applications of one of the oldest concepts in music theory: Pedal Points. What I mean is that most music theory book just dedicate a few short lines to Pedal Points, and many teachers simply don't think to do lessons about them. After all Pedal Points are a simple concept, and many think that they are simply "obvious". Ok, I was joking. Here's the real explanation: a Pedal Point is just a note that is kept sounding for longer than it should. It can be that you are playing the same note over many chords, or it can be that you keep playing the same note throughout a phrase. The effect is great, and this is why Pedal Points have been used in all music from Bach to modern Pop, and everything in between. I know what you are thinking now: "Hey this is what Artist X is doing in their song Y". Yes, yes it is! Pedal Points have a very distinctive sound and so they make any song immediately recognizable. No wonder so many great musicians used them. And now, you can use them too: as you see they are not difficult at all!